[ek-suh-bish-uhn-ol-uh-jist] -noun: Person who studies and reviews exhibitions, then blogs about them. David Bowie is the single greatest solo artist popular music has ever produced. Anyone who doubts this simple fact (and I assume there is not anyone reading this who does, but for the sake of sounding diplomatic I thought I’d say this anyway) should give Ziggy Stardust and Aladdin Sane a few listens, and if somehow that still isn’t enough to convince them (a barely conceivable concept, surely?) then they can take their pick of pretty much any one or two of the rest of his 1970s albums and they will be converted (I’d go for Station to Station and Low). I became hooked on the music of Bowie as a teenager, like an awful lot of other teenagers. Only I was not a teenager in the 1970s, or the 1980s, and as such I completely missed out on the wave of excitement and hysteria that gave birth to a superstar and an icon. I can only imagine how exciting it must have been to have sat in a sterile, probably brown-and-orange 1970s living room in suburbia and watched this bizzare-looking creature singing ‘Starman’ on that legendary Top of the Pops appearance from June 1972 (is that a man? a woman? an alien from outer space?). I can only wonder at how exhilarating it was to have anticipated each new Bowie record and each new accompanying alter-ego, and how enthralling it was to get to dive into yet another new sound as he changed musical direction again and again (there was a new album every nine months at his peak – today’s artists are frankly pathetic by comparison). Without having lived through the era that he helped define, and being part of what was surely the most consistently and richly rewarded musical fandom of all time, I am as such able to let the music speak for itself, a simple stack of CDs enough to convince me that there is no one before or since that has got near him. All that went with the music – the concert performances, tv appearances, costumes, stage designs, videos, and the whole kaleidoscope of art and imagery that he created – is, so to speak, surplus to requirements. 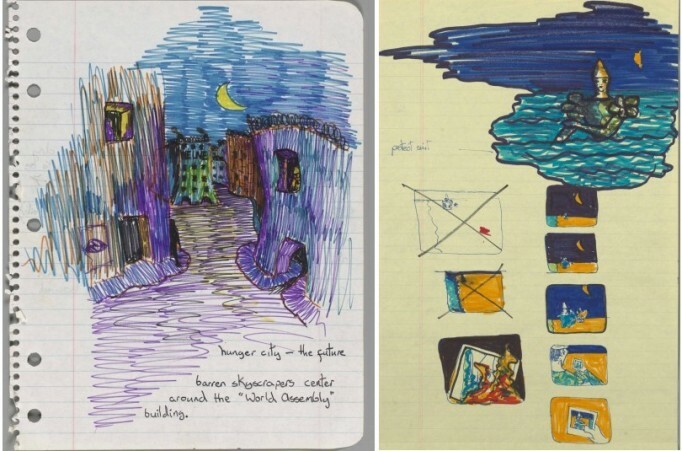 The fact that he was as supremely gifted an all-round artist and visionary as he was is simply a nice bonus. At the Victoria and Albert Museum – in two visits so far – I was able to immerse myself in this side of Bowie, and start to appreciate his artistic legacy on a whole new level. That’s not to say for one second that David Bowie Is doesn’t focus on the music. This exhibition’s crowning achievement is how it manages to bring together the music I already knew and loved with the iconography and the imagery in a kind of seamless whole. However, I think it is fair to say that the sheer quantity of material, and the rather haphazard way it comes at us (walls, screens, hanging from the ceiling, through holes in a door, etc. etc. ), will make for a somewhat disorientating experience for some. There are some 300-odd objects in all, most of them from Bowie’s own personal collection, comprising both the art and literature that influenced him and the art that he created, alongside photograph and film documenting his extraordinary career. It was certainly brave of the curators of this exhibition to have not presented it all as a linear, chronological journey through Bowie’s career – after all the first section exploring his childhood and teenage years certainly creates this expectation. And the audio guide, automatically prompted by walking towards a certain accompanying object or display, works tremendously well most of the time but sometimes delivers sound that is completely unrelated to what you are looking at, exasperated by the fact it is often difficult to choose exactly where you want to stand in an exhibition as crowded as this. My advice? Go first thing in the morning and allow yourself plenty of time, then meander around rather aimlessly, looking at whatever catches your eye, and not worrying in the slightest about what order you’re taking things in. If there is one thing from the audio guide that I would make sure you hear before leaving, it is Howard Goodhall’s fascinating insight into Bowie’s take on the Rolling Stones’ ‘Let’s Spend the Night Together’ from Aladdin Sane. Goodhall describes it as not a mere cover version but as an illustration of Bowie’s brilliant ability to take what has come before – be it from music or other art forms – and turn it into something groundbreaking and new. Bowie’s plethora of artistic and literary inspirations were cherry-picked from, as Goodhall calls it, the ‘department store of late 20th century popular culture’ – an rather apt way to describe the whole exhibition. For it shows not only Bowie’s art, but the art of those that came before him and influenced him, and what is so striking is just how wide Bowie cast his cultural net. Bowie describes in an interview how, as a young man in the ‘swinging’ London of the late 1960s, he went to see as many European arthouse films as he could, and bought as many modern jazz albums as he could get his hands on, not because he understood any of it or even enjoyed any of it, but because he wanted to take in as much of all that was experimental and avant-garde as possible. The result is a range of influences more diverse and eclectic than most mere mortals could even get their heads around. I learned from this exhibition, for instance, that it had been George Orwell’s novel 1984 that had inspired Bowie to create his own dystopian epic which was originally intended to be a feature film – his own storyboards for the film are on display – but ended up as the Diamond Dogs album and spectacular accompanying stage show. Then there was Brian Eno, Bowie’s close collaborator during his Berlin period, during which he recorded the heavily experimental trilogy of Low, Heroes and Lodger between 1976 and 1979. On display is a small box of ‘oblique strategies’ cards, created by Eno and Peter Schmidt and given to Bowie as a birthday present during the Heroes sessions, each containing instructions for the musicians on how to play (among them “work at a different speed”, “use an old idea” and “what would your closest friend do?”). 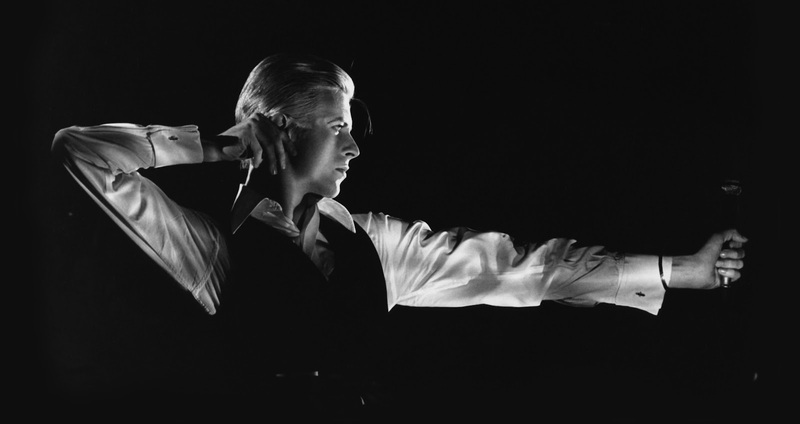 And then, of course, there are the inspirations for each Bowie look, or character, their origins often surprising – such as the cabaret scene from Weimar Germany that inspired the clean-cut, monotone starkness of the Thin White Duke (the white shirt and waistcoat are here too). I had been a little worried that this would be an exhibition mainly focused on clothes, but the variety of different material on display here meant that even a fashion ignoramus like me has plenty to stare in amazement at (for fashion enthusiasts there is an eclectic mix from a whole host of designers, from Kansai Yamamoto’s outrageous striped bodysuit – an Aladdin Sane state costume – to Alexander McQueen’s distressed union-jack jacket from the late-1990s Earthling tour). I particularly enjoyed how much video footage there was, from numerous interviews with Bowie and the producers, artists and designers he has worked with over the years played on small screens, to the mesmerizing concert footage booming down from a tower of screens the size of a house. In fact the concert section is almost worth the entrance fee alone – not only is there enough footage to keep you watching for what seems like a large part of the day but the quality -and volume- of the sound is simply awesome. There’s my other piece of advice – stay in this section until you’ve seen everything! Massive fan of Bowie’s music that I am, I loved the album artwork designs and sketches, demonstrating Bowie’s remarkably hands-on approach and all-encompassing vision for each of his albums. “I have to take total control myself,” he explained to postmodernist author William Burroughs in his 1974 interview with Bowie, “I can’t let anybody else do anything, for I find that I can do things better for me.” There is also, for the music nerds like me, lots of handwritten lyrics and the occasional scrap from a studio session notebook. Seeing Bowie’s scrawly handwriting complete with crossings-out and corrections was fascinating. Turns out the 1980 classic ‘Fashion’ nearly contained “shop! shop!” backing vocals, while “hope you’re happy too” from ‘Ashes to Ashes’ was originally jotted down as “hope you’re hopeless too.” The lyrics to ‘Blackout’, meanwhile, were written using the so-called cut-up technique, where words and phrases are jotted down on paper, randomly cut up into sections and then put back together in a different order. It was a technique made famous by both William Burroughs and by American poet and writer Brion Gysin before him. And then, away from the music he was making, there are some of Bowie’s paintings, both portraits and landscapes, a product of a lifetime hobby and a pastime that he found particularly therapeutic whilst living in Berlin trying to overcome his cocaine addiction. There is probably no other musician about whom an exhibition like this could be created, for reasons that I feel are best summed up by art critic Tony Parsons in a quote splashed across one of the walls. “He has seen lesser talents carve entire careers out of his passing phases.” It is an exhibition where fans like me can learn something new, and where anyone with any kind of interest in art can marvel at a talent who, it seems to me, wanted to pay his own tribute to what was a truly remarkable period in human history and an equally remarkable period of cultural and artistic output. The cultural department store of the late twentieth century is open for business, so grab yourself a basket and go shopping! 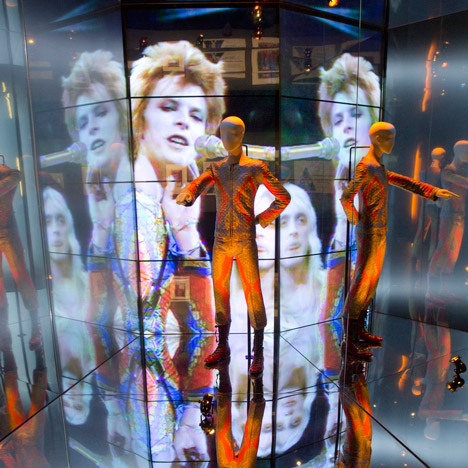 David Bowie Is runs until 11th August 2013 at the Victoria and Albert Museum in South Kensington. Tickets, priced at £15.50, have already sold out online, but can still be purchased from the museum’s front desk so long as you get there as soon as they open at 10am! Tags: 1984, Aladdin Sane, Alexander McQueen, alter-ego, Berlin, Bowie, Brian Eno, Brion Gysin, culture, cut-up, David Bowie Is review, exhibition reviews london, exhibitions london, fashion, George Orwell, Germany, Howard Goodhall, Iggy Pop, John Rowlands, Kansai Yamamoto, lyrics, oblique strategies, painting, Peter Schmidt, photograph, Starman, storyboards, Terry O'Neill, The Immortal, the thin white duke, Tony Parsons, Top of the Pops, V&A museum, Victoria and Albert Museum, Walter Ross, William Burroughs, Ziggy Stardust. Bookmark the permalink. Look forward to reading more of you, thanks for your like.